Confession #1: Last night I drove to work just so I could take a shower at the gym. I know it sounds silly, but I did this for two reasons: 1) I had just finished cleaning the bathroom and it seemed like a shame to undo any of my work so quickly, and 2) The water pressure in my shower is ridiculously low. It’s been getting worse recently and I finally called my landlady about it last night. Fortunately, I live close to work so I could just drive over there for a quick shower. And it was glorious! Confession #2: I was planning to skip my spinning class this evening. Call me lazy, but I’ve still got a lot of stuff to do before my parents arrive on Wednesday. This afternoon I was going to clean my kitchen and go to the laundromat to wash towels, but those best laid plans had to be set aside when a plumber was working at my apartment when I got home. So I got right back in my car and went to the gym for spinning. Of course I’m glad I got a good workout today, but I also got to a guaranteed good shower at the gym. It turns out that the plumbers visit didn’t help the water pressure at all so it’s a good thing I didn’t bank on showering at home tonight. My landlady said she would fix the problem tomorrow. I hope so, or else I’ll have to drive my sweaty self to the gym for a shower after my run! Last night I decided to go for a run. Since I was still feeling fairly sick I didn’t know if it was a good idea or not, but I was unwilling to miss more than one training run with the half marathon right around the corner. (And I missed out on watching the “Doctor Who” series 8 premiere live, but I figured the run was worth it.) As I got started I told myself that I could stop and walk at any point if I didn’t feel right. The last thing I wanted to do was exacerbate my illness. I was a little worried when I got started because my throat felt tight, but otherwise I felt great! Better than I’d felt running in a long time. What a relief! It was one of those rare times when I felt like I could run forever. I finished 4 miles without stopping, which is unusual for me, and I didn’t really want to stop! If I feel anywhere near that good next Sunday (one week from now – eek!) then I’ll be in good shape. Besides my last few training runs, I’ve got a few other Disneyland Half Marathon preparations in progress. This afternoon I started cleaning my apartment in anticipation of my parent’s arrival on Wednesday. My bathroom is now spotless. I’ll finish cleaning everything else over the next two evenings, along with washing a load of towels at the laundromat. Really exciting stuff, huh? But I didn’t spend my entire day doing chores. This morning I finally went to see “Guardians of the Galaxy,” and then I came home and watched the “Doctor Who” premiere. The movie was a lot of fun (but not as good as the last few Marvel movies I’ve seen), and I really enjoyed Doctor Who. 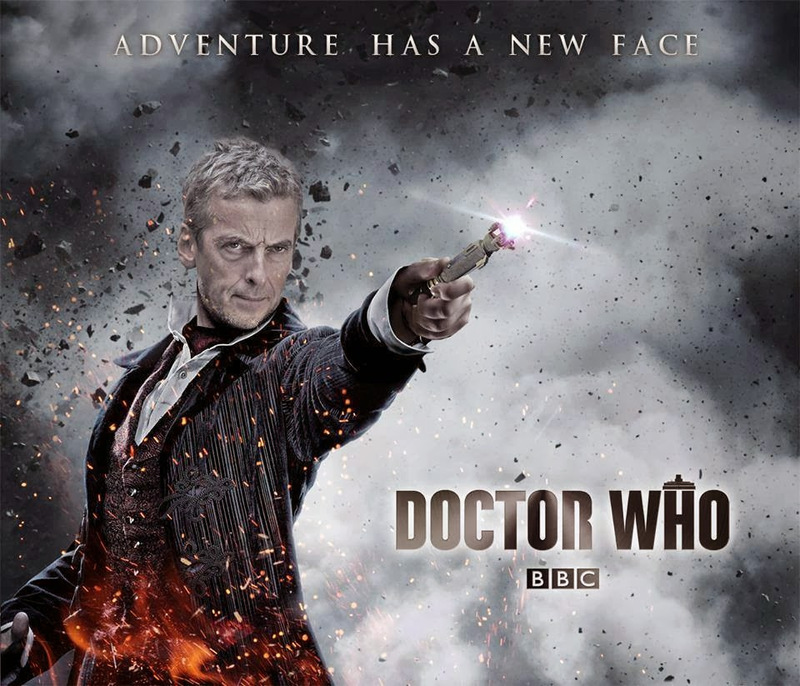 It was a great introduction to Peter Capaldi as the 12th Doctor, and I can’t wait for the rest of the season. But now it’s time for me to start getting ready for bed. It’s going to be another crazy week at work, but at least my cold is improving. 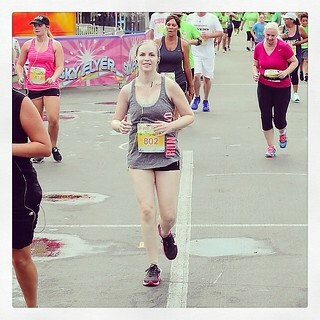 Only one more week until the half marathon! I intended to post this illness update yesterday, but I was feeling a bit better in the evening so I went to the laundromat rather than laze about on the couch any more. (The dark chocolate brownie recipe was already written and ready to publish so I posted that instead.) My parents are arriving for a visit on Wednesday and I needed to wash bed linens so they’ll have a clean place to sleep. After feeling really horrible when I woke up in the morning, I was actually pretty surprised that I had the energy to leave the house last night. Even though I had only slept a few hours the night before (my sinuses hurt like crazy unless I was propped up on three pillows), I had to go to work yesterday morning and wrap up a test. I felt absolutely awful – sneezing all over the place and going through a whole box of Kleenex with my runny nose – but there was no way I could stay home. The only good news is that I finished up at 11 AM so I went home early and went back to bed. A short nap and some relaxation seemed to work wonders. I still didn’t try to go running last night, though. At this point I’ve only missed one 3-mile training run due to this stupid cold, but I still don’t like it. I don’t feel all that prepared for the half marathon as it is, so missing any planned preparation scares me. But I wasn’t willing to risk hindering my recovery by trying to run last night. I absolutely must be healthy by next Sunday or the race is going to be miserable! I was really hoping to sleep better last night, but sinus pain still woke me up around midnight. I’m definitely feeling better today (I can breathe out of both nostrils, which is a plus), but not that much. I went to Disneyland this morning and walked around for a couple of hours, which was pretty much my first physical activity since my run on Tuesday night. It didn’t help that it was pretty warm in Anaheim, but I was discouraged by my lack of energy. Hopefully that changes soon. I don’t have time to be sick – this week is going to be way too busy! P.S. Doctor Who season 8 starts tonight! P.P.S. Gator football starts next Saturday! First of all, I have a cold. This is annoying for two reasons – 1) The rest of this week is going to be unbelievably busy for me at work and there is no way I can take any time off, and 2) I can’t afford to get really sick this close to my race. Luckily I only seem to have a sore throat, a headache, and a low grade fever so far – all symptoms that can be greatly improved by some Aleve. At the moment I’m not feeling too badly, but I still left work a couple of hours early so I could get some rest. And while I’m resting I figured I’d share part of my final Disneyland Half Marathon preparations. Based on the horrible experience of last Saturday’s 14-mile run, I’ve decided to make a few changes before the Disneyland Half Marathon. The first one is giving up soda. I’ve done this, or at least attempted to, many times with various degrees of success, but I keep going back. But unfortunately in the last few months I’ve become a full-blown Coca-Cola addict. This must stop. Not only will it be good for my diet and health in the long run, but hopefully flushing the mega amounts of sugar from my system will help with my running. Sugar definitely tends to upset my stomach when I run so we’ll see if avoiding soda makes me feel better. As much as I love Coke, I will gladly say goodbye if there’s any chance I can improve my running performance. Eliminating one of my favorite treats from my diet is easier said than done, though. I’m only on day 2 of no soda and I’m craving a sugar fix like nobody’s business. I know it will get easier, but right now I keep hoping to find a leftover can in the fridge each time I look for a snack. Is there a support group for soda addiction? 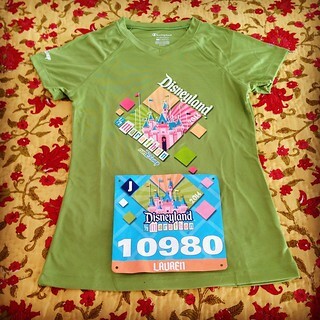 Two weeks from today I will run the Disneyland Half Marathon. (Or attempt to run, at least. I’ll get back to that in a minute.) I signed up for it back in January on a bit of a whim when I had just started running again after the first of the year. I was riding high on a wave of endorphins, I think. But despite the confidence my running regimen was giving me, I was still apprehensive because I was still such a beginner. Registering for a 13.1-mile race more than nine months in advance when I hadn’t run in any race at all seemed overly ambitious, to say the least. But at the time I was assured by some experienced runners that there was more than enough time for me to prepare for a half marathon in August, even in my fairly novice state. I’m starting to question that advice, honestly. After a burst of dedication during the first few weeks of the year, my running routine came to a screeching halt due to injuries (my overpronation was wreaking havoc on the tendons in my ankles) and surgery (necessary, but annoying). But my on St. Patrick’s Day I hopping on the treadmill at my hotel while I was on a business trip and started running again. My official half marathon training started back in April. I cruised along for a while without too many problems, and then I tried to run 8 miles. It was like running headlong into a brick wall for an hour and a half. It was truly awful and it made me question everything I was doing. But then subsequent 7-mile and 11-mile runs went great! I was on my way to a spectacularly successful half marathon! Or so I thought. Two weeks ago I ran a horrible 12.5 miles. It was hot and humid (it’s been a very unusual summer in LA, weather-wise), and I felt sick to my stomach the entire time. I had to stop and walk much more often that I planned which was discouraging. And my body was in shock the whole next day. I had no energy and I couldn’t eat without feeling nauseous. Fun, right? (Then I made the mistake of running the Orange County Fair 5K – check out the above photo – two days later, but that’s a whole other story.) Despite that horrible experience I was confident that my 14-mile run last night was going to be great. After faithfully following my training program for nearly four months I thought I was prepared. Apparently I was wrong. It was almost 3 hours of pure misery. I felt like I was going to puke pretty much the whole time, and more than once I was ready to drop out of the Disneyland Half Marathon. It was so awful that I wanted to throw my running shoes away and never get up off the couch ever again. But I didn’t give up until I finished 14 miles, and I’m proud of that. I could barely stand by the time I got home, I got a bit hypothermic after about 5 minutes of sitting, and I slept really badly, but I did it. Fortunately by the time I woke up this morning I no longer wanted to quit running, and now I’m determined to do whatever I can to make my half marathon go as smoothly as possible. I’ve already identified a few changes I need to make, but I’ll save those for another post. My next long run will be the half marathon itself in exactly two weeks! I’m excited and nervous at the same time! This recipe is long overdue since I made this Crockpot hot chocolate for the annual holiday potluck at work last December, but it’s worth waiting for! I made the hot chocolate as my contribution to the potluck breakfast buffet. It was fantastic for something that I just dumped into the slow cooker and let heat up for a few hours. The only downside was that the chocolate chips didn’t melt completely so it wasn’t as smooth as I was hoping. Either I didn’t let the mixture cook long enough or the chocolate I used wasn’t the best quality (how does Nestle rank on that scale anyway?). An immersion blender might have helped if I’d had one handy. But the hot chocolate was still really rich and everyone at the holiday potluck loved it, even with little bits of unmelted chocolate in their glasses. I’d like to try a slightly different version that uses cocoa powder and sugar instead of chocolate chips to see if that fixes the problem. Maybe for this year’s holiday potluck! Get ready for some complicated instructions. Ready? Stir together the whipping cream, condensed milk, milk, vanilla, and chocolate chips in your slow cooker. Cover and cook on low for 2 hours, stirring occasionally, until the mixture is hot and the chocolate chips are melted. Make sure to stir well before serving. That’s it! Enjoy! Based on Mrs. Happy Homemaker’s Creamy Crockpot Hot Cocoa. It’s a good thing I took a few hours off yesterday morning because as soon as I got to work I felt like I was swept up by a current that was traveling at a breakneck speed. I had at least three ultra high priority task that needed to be done ASAP, and the day was over before I knew it. It was exhausting. Do you ever have one of those days where you get started on something important, but then something else that’s more pressing comes up? And then another task that’s even more urgent trumps both of those things, and on and on and on. Then many hours later you try to recall what it was you were first working on at the beginning of the day, but you have absolutely no idea. Yeah, that was my day. I left several jobs undone, but at 6 PM I went home anyway. I’ve been working a lot over the last three weeks and it’s taken its toll. Yesterday I asked someone if it was possible to be burned out when it was only Tuesday. Of course the answer was yes. I’ve been taking as much time off as I can to maintain my mental health, but there’s a very long list of tasks I need to complete in a very short time. But that’s how it is sometimes. I’ll manage. Thinking about lazy mornings like the one I had yesterday reminds me of what I have to look forward to during quieter times. It was so nice to have a few hours to eat a leisurely breakfast (I walked over to McDonald’s and got an Egg McMuffin), watch a little TV (there was a great episode of “Doctor Who” on BBC America), and get some things done around the house (I washed a whole sink’s worth of dishes that had been sitting there for a few days). It was lovely. Of course, I did have to watch the clock so I would be ready to sign up for the Tinkerbell Half Marathon when registration opened at 9 AM. I even brought my laptop into the kitchen with me at 8:30 AM so I could hit refresh on the race registration page every few minutes. I was worried that the Pixie Dust Challenge would sell out really quickly so I wanted to sign up right at the top of the hour. And I did. No problem! I was so exhilarated by my success that I figured it made staying home for that singular reason completely worthwhile. Little did I know that I could have waited until I got home that evening and still been able to register without any trouble. None of the races sold out within the first 24 hours, which is unusual for a Disney event. Oops! But having a few hours to myself in the morning was still really lovely. I need to do that more often.